A brand is generally associated with elements which help us identify it such as logo, symbol, and a slogan. However, in reality, the notion comprises far more aspects we do not notice at first glance. 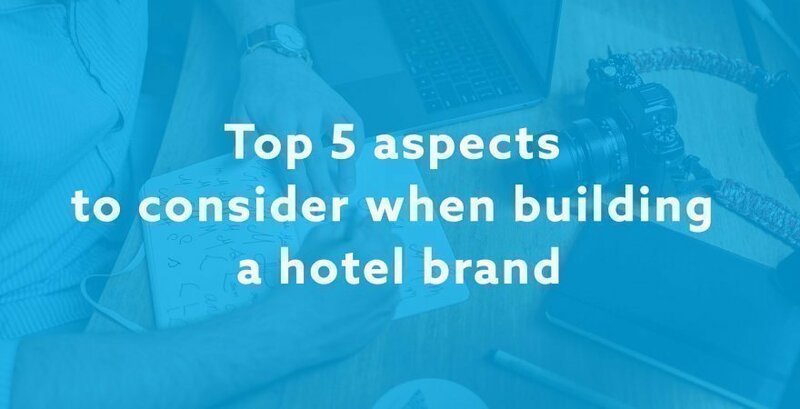 In this article, we will try to introduce you with 5 most important aspects when building a hotel brand. A type of brand that does not emulate anyone but, in contrast, inspires the competition. First: The main event. Find your distinct feature. Hilton, Marriott, Sheraton, Mercure, Dr. Irena Eris - the brands everyone has heard of. They are not only recognizable, but also have their value. Hilton, whose market value is 8.4 billion USD , is leading the way. Years of consistent brand building stand have contributed to such a result. Obviously, a hotel with an established reputation is designed to properly cultivate the brand and maintain appropriate standards. For younger brands, the starting point of a long-term plan is to find a distinctive feature which will help to build the identity of place with a kind of added value. One does not need to look far to find more examples. Cinema Residence has been created for the love of cinema. It is distinguished by 22 film suites dedicated to the best Polish films and series. Dr. Irena Eris hotels are the synonyms of luxury and the holistic care of the soul and body (thanks to the luxurious SPA). Piwniczna Hotel combines elements of Lemko folklore with minimalism to tempt enthusiasts of etnodesign. The designers of Hotel Copernicus Toruń had a similar concept in mind. The hotel, a gem of modernity in Toruń, combines the centuries-old traditions of this beautiful city with modernity and, of course, references to astronomy. It is also worth to mention the unusual concept of Quadrille hotel , which invites guests to an amazing journey (only for adults) to the world of Alice Adventures. The interior design, the name of the restaurant or pub - a concept refined in the smallest detail, makes the stay an extraordinary experience. The point is to achieve the goal - to make the brand more recognizable, to make it distinct and unique. It is important especially in locations with hotels of a similar standard. Finding a distinct brand feature should be the starting point for the consistent hotel image building. It is the unique feature which determines many strategic decisions from the point of view of the brand. Such decisions include the color of interiors, advertising slogan, form and type of communication, as well as promotion tools, staff uniforms, etc. It is worth remembering that image does not only comprise what is visible on the outside but, especially in the case of a hotel, the inside. The image consists of the smallest elements: pendants for handles, cosmetics in the bathroom, hotel brochures, the design, and even the fragrance. We need to take care of each of these elements, because they create the overall image of the hotel, and therefore the brand. The image is also built through the messages we provide to guests, both in writing and verbally, at the hotel, in the press, on the website, in newsletters, and on social media. The coherence of messages is an important element of brand building and the dissemination of its value. However, one also needs to bear in mind that messages must be tailored to the medium and the target group. Third: Adaptation. Speak the language of your clients. Coherent communication is a prerequisite for building a positive brand image. However, the consistency should be understood as general guidelines on the content to be transmitted, which must then be adapted to the place where it will be placed. Elegant messages, full of grandiloquent formulations do not fit social media, just like very direct content used in the form of an invitation to special events. This is why, it is so important to distinguish the groups of clients that we want to attract to the hotel, reach with the message, and construct it accordingly. To this end, we need to specify not only the Guest's status and age but also the main reason to choose our hotel (highlight the advantages: proximity to nature, location close to entertainment, great facilities for children, etc). Fourth: the Ambassadors. Building a brand in everyday practice. Building the hotel brand is predominantly performed on site, in everyday service. Thus, it is extremely important to properly instruct employees who, as part of their duties, become true brand ambassadors, if only they identify with, believe in the brand, and like their jobs. The ambassadors of special care and attention are the satisfied Guests. Your guests will naturally share favorable opinions about the hotel if they feel that they have been treated in the best style. The standard of equipment, additional attractions, quality cuisine, and a discreet, professional, helpful and friendly service are the most important elements which convince guests to the hotel brand. Popular and recognizable brands have been successfully implementing their promotion strategies for several or even several dozen years. However, not every form of advertising will support brand building. This is why the choice of promotional tools should correspond, firstly, to the general image of the hotel, and secondly, to be adequate to the pre-selected target groups. The guarantee of recognition lies in the use of many channels, including offline channels: billboards, leaflets, magazines, TV or radio, as well as online channels: social media (Facebook, Instagram), AdWords (text search engines, banner campaigns, YouTube) and metasearch: Google Hotel Ads, Trivago, Tripadvisor. The main difference between offline and online campaigns, regardless of their goals, is measurability. While offline campaign results can be difficult to estimate, online tools allow you to accurately check the performance of a single ad in AdWords. A well-thought-out online campaign allows you to increase the percentage of direct bookings with the system on the website or the hotel reception. These "points of contact" should be zealously refined - the booking system should be simple and intuitive, the reception staff should be professional and helpful. All this to build the strength of the brand also in this aspect - that guests want to make reservations directly. Hotel brand is the essential value - it builds the hotel's identity and image among both the existing and potential guests. A well-thought-out brand strategy allows us to achieve two long-term goals: creating the need to visit a hotel and, of course, increasing the number of direct bookings. The stronger the brand, the higher the number.